The "Invoices" sub-group of the "Other Settings" panel allows the administrator to define invoice settings that will determine how the invoice displays. The settings are separated into two groups, Basic and Advanced. Please contact iLab support‍ to access the 'Advanced' setting options. Allow invoices to be grouped by study: Define this field as YES if you would like to group invoices by study when creating a billing event. NOTE: This setting is only applicable for cores that utilize the Study module. Hide charge details in the invoice page: If defined as YES, charge details are collapsed on the invoice. The customer can expand each section on the invoice to view the charge details. Show billing event name on invoices: Define this field as YES if you would like the billing event name to display in the top left corner of the invoice. Track financial approval for internal invoices: Define this field to YES if you would like to be able to track financial approvals for all internal invoices. Track financial approval for external invoices: Define this field to YES if you would like to be able to track financial approvals for all external invoices. Minimum internal invoices total amount to require approval: Define the minimum invoice total that will require financial approval. For example, you may define it as $250. This means that any internal invoices $249 and lower will not require financial approval. Minimum external invoice total amount to require approval: Define the minimum invoice total that will require financial approval. For example, you may define it as $250. This means that any external invoices $249 and lower will not require financial approval. Invoice customer number: Core administrators can enter a number manually that will serve as customer number for all invoices. Bulk invoice email template: When using bulk actions to send emails, enter the text you would like to include in the email to customers. Custom invoice header: Create a custom header to include on all internal invoices. Custom invoice header external: Create a custom header to include on all external invoices. Custom invoice footer: Create a custom footer to include on all internal invoices. Custom invoice footer external: Create a custom invoice footer to include on all external invoices. Custom invoice note: Create a custom note to include on all internal invoices. 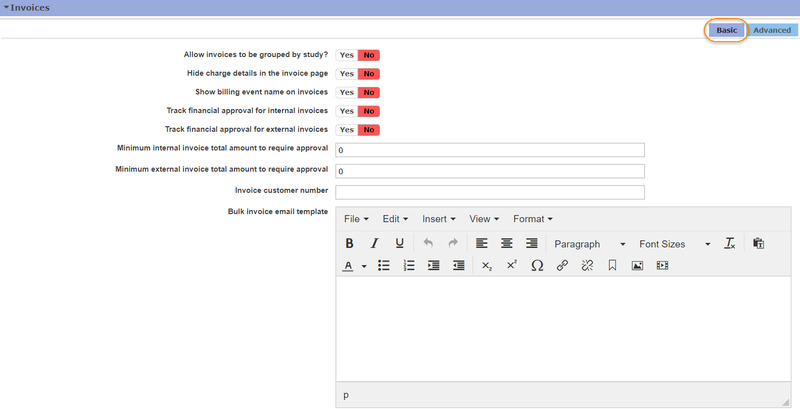 Custom invoice note external: Create a custom note to include on all external invoices. Don't make invoices visible in the search view, by default: If defined as YES, core invoices will not be included in search results BY DEFAULT. You may include them if you wish, but you must do so manually. Show summary by payment (po number, etc) information at top of invoice: When defined as YES, payment information will display at the top of the invoices. Include the custom reportable service request field on invoices? : Define this field as YES if you would like any custom fields on the service request to display on the invoice. Include invoice summary section on service requests: When defined as YES, this field will display the invoices associated with a service request within the 'Payment Information' section. Show tax subtotals in the invoice Total: When defined as YES, the subtotal will display on the invoices. If yes, include the custom core name as part of the invoice number after the institution initials: If you define this field as YES, the invoice number will include the custom core name defined in the next setting. If above setting is on and institution "Allow custom core name in invoice numbers" is on, this should be defined per core: Enter your custom core name for invoice numbers here. This will display the custom core name followed by the invoice number. In the case below, we have entered "Cell Imaging" as the core name to precede the invoice number.